According to Rilwan, he was passing through Eiye territory in Badagry a few days before the incident when some of the members of the group threatened him with a gun. He left the scene and few days later mobilised the members of his own cult group to the scene. But Rilwan, a computer graphics designer, denied knowing who did the shooting once they got to the scene. He said, “After the threat I received, I informed a member of my group named Nami, who mobilised other members and told me to take him there. Saturday Punch learnt that by the time dusts settled, two members of the Eye Confraternity – Ajilero Idowu (22) and Anweto Adebayo (28) – had been shot dead by members of Rilwan’s group on August 27. But Rilwan insisted he was not one of the shooters. He was arrested four days after the incident alongsides six others – Adewale Kazeem (23), Olajide Zanu (21), Adebisi Adekunle (35), Tunde Adekanbi (32), Ogunlade Femi (28), Olufemi Babatunde (30). 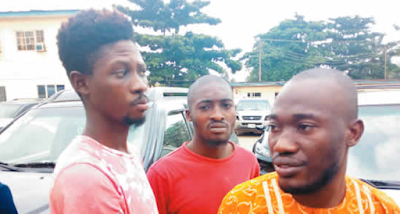 They were paraded with other suspects by the Commissioner of Police, Lagos State Command, Mr. Edhal Imohimi on Thursday. Explaining how he became a member of the confraternity, Rilwan said he was invited to a birthday party without knowing it was a cult initiation. “On our way, the vehicle diverted to a bush and we were all told to disembark at a point. They started beating us. After the beating, they told us we were now Aiye (Black Axe) members,” he said. Two other members of his gang told journalists that they were initiated in similar fashion. But Adekunle, who is a member of the Eye Confraternity, which lost two of its members in the clash, said his elder brother initiated him in their living room 10 years ago. He said, “One day, he called me into his living room and told me to kneel and close my eyes. He slapped me hard across the face. Then he told me to stand and open my eyes. “He drank gin and spat it in my eyes and announced that I had now become a member of the Eye Confraternity. “Shortly after I was initiated, my parents relocated to Badagry and I joined up with other cult boys in the town. I have never killed anybody in my life. The commissioner of police said the suspects would be charged to court as soon as possible. Imohimi said over the last one week, five kidnapping suspects were arrested in the state while six guns and 16 live cartridges were recovered from criminals. According to him, his men also arrested members of a gang which distributed cocaine, heroin and Indian hemp in Surulere, Lagos. He said, “At about 7.15pm on September 11, the gang members were going for a robbery when they were spotted by members of the local security who alerted our men. “The prompt information we received allowed our operatives to move in and arrest the suspects. “Investigation showed that the group led by Saidi Kuku specialised in the distribution of hard drugs, cocaine, heroin, codeine. Imohimi said one of the main thrusts of his policing plans would be to go after drug dealers. He explained that there is a close connection between crimes and drug abuse. “That is why I have charged all area commanders and divisional police officers to identify kiosks and locations where they sell cocaine and heroin rather than sit in their offices,” he said.